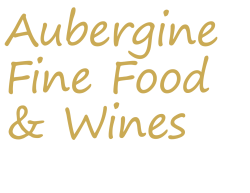 Aubergine Fine Food & Wines is a family-owned delicatessen, wine merchant and caterer, established in Woburn Sands by local residents Jill and John Goulding in August 2007. Jill’s flapjack; Donge Brie de Meaux; Fontodi Chianti Classico; Arden coffee; Rustichella pasta; Glen Carlou Cabernet Sauvignon; Montezuma’s chocolate buttons and many more. We also offer an extensive range of sandwiches, salads and other dishes, freshly prepared to order from our delicatessen counter to eat-in or take away. We LOVE coffee and cake. All our cakes are homemade and we work hard to serve fantastic coffee from an exclusive blend of fair-trade beans. Plus, we cater for corporate and private events from our popular event menu or we can create a bespoke selection tailor-made for your event. One last thing. We love music and enjoy playing an eclectic selection of sounds in the shop. From Jazz and Latin to Van Morrison, from Bombay Bicycle Club to Nick Drake, if you think there’s something we should be playing, let us know.